Why is my 1hz water pump different? So i went to replace my water pump on my 1hz the other day. Went to repco and got a new water pump. Got home took the old one off and its different to the one i got. Took it back to repco and according to them the water pump i got is the only one available for the 1hz. Re: Why is my 1hz water pump different? Bit hard to tell, does it fit up even with the extra bolt hole on the old one? No, the new pump doesnt quite line up, there is a small gap where the extra bolt hole is. The original looks like a genuine AISIN one so suspect that the bodgy chinese made water pump you bought to replace it is like alot of non genuine stuff, and just poorly made from the start. Since they are just copies, not made off blueprints, they are never going to be exact and often are simply nothing like the original parts. Do yourself a favour and get a genuine one from Toyota. You know it will last another 400K like the original one did. I have found that a lot of non Gen stuff for 4WDs is rubbish. Never fits and never lasts. But I'd expect better than that from Repco. I thought the same, but doing some research online and all the pictures of a 1hz water pump are of the 9 bolt one like the repco one, whereas mine has 10 bolts?? But there is no way it can be a different engine as everything else is the same (bought a cambelt kit which fits fine). Maybe there is a difference in some of the 1HZ donks. Check your year and what not here at the parts ref website. Just enter your VIN if you have it, or go through the rest of the selection process. 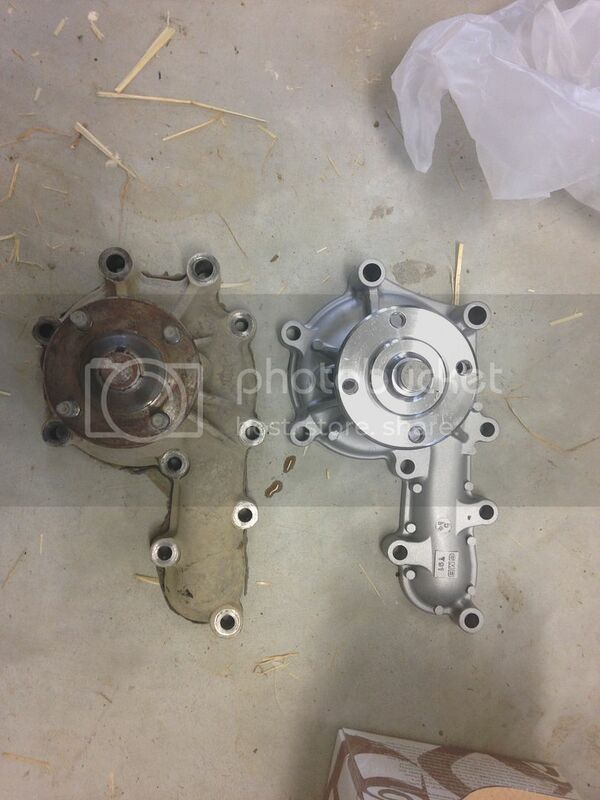 And you might find there is a different part number for the water pump for different years / markets. If your car is originally from a different market (eg Jap import / PNG market / Aus market) there might be a few differences. I doubt a dodgy aftermarket supplier would pick up on these subtle diffs. Or, just go the Toyota joint and ask them. Show em the original and what not. Hi, I have the same problem with my 1PZ 1992 Water Pump. Mine has 10 bolt holes and all the replacement pumps including Toyota are 16100-19235 which have 9 bolt holes and don't fit . Any suggestions? Keen to find out the difference. About to do timing belt and pump on mine. Water pump different, same as this thread! I have a Land Cruiser with a 1HZ. It has a 10 bolt water pump and I can’t find one the same for love nor money. I keep getting sent a 9 bolt pump that doesn’t fit! Block casting number is 00000090 so I suspect an early prototype block. Unable to fit the new 9 bolt pump and drill + thread new bolt holes. 70 series Cruiser converted from petrol to diesel, so my chassis numbers are no help. Did anyone get to the bottom of this thread? I would be ridiculously grateful to hear how these people got on. Have also tried all the GNB catalogues and all 1HZ’s list a 9 bolt pump, irrelevant of vehicle they were in. Have tried Coaster buses etc etc.